The College of Education has devised many bold strategies and collaborative initiatives with Florida school districts in recent years to boost the state’s ailing STEM education programs—science, technology, engineering and mathematics. The backbone of this effort, however, is the college’s core academic programs in teacher preparation and its advanced degree programs in science education, mathematics education and education technology . . .
ProTeach, the college’s nationally ranked and accredited teacher preparation program, provides opportunities for students to earn an M.Ed. degree in Science and Environmental Education while developing the competencies required for a Florida professional teaching certificate for the secondary school grades 6-12. UF students also can earn an M.Ed. degree in an accelerated, alternative teaching certification program in mathematics through its state-approved Educator Preparation Institute–designed for career-changers who possess a bachelor’s degree outside of education. The math EPI includes a practicum experience in Alachua County schools and additional opportunities to observe and assist in supervised teaching in grades 6-12. For practicing educators at any level seeking to advance their subject knowledge and careers, the college’s School of Teaching and Learning offers master’s, specialist and doctorate degree programs in science education, mathematics education (with statistics education option) and education technology. 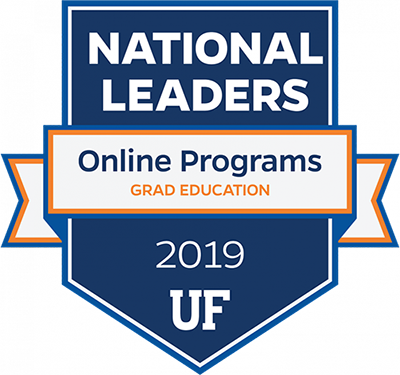 According to the 2015 U.S. News and World Report rankings of America’s Best Graduate Schools, the UF College of Education’s graduate programs in elementary teacher education and in curriculum and instruction are both rated among the top 20 in the nation in their respective specialty areas. The college’s Online Teacher Education program is rated fifth among U.S. public universities by TheBestSchools.org. U.S. News also has rated the college’s online master’s degree programs among the top 50 distance education programs in the nation. These include the Education Technology master’s program in the School of Teaching and Learning. Science and Environmental Education: M.Ed., M.A.E., Ed.S., Ed.D., Ph.D. Mathematics Education (with Statistics Education option): M.Ed., M.A.E., Ed.S., Ed.D., Ph.D.
Education Technology: M.Ed., Ed.S., Ed.D., M.A.E., Ph.D.
Our Educational Technology programs are not eligible for STEM-OPT extension​s.